Night photography is great fun, because you can never really predict the outcome exactly. And from a creative perspective it is even better, because you have more influence over the light. For this shot of two dead camelthorn trees I started already when it was still light. I chose this composition and used my GPS to determine precisely where true south was, as I knew that is where the stars would circle. Then I waited until the sun had set and started shooting when there was only a very subtle afterglow visible on the dunes in the background. I programmed my camera to take as many images as my battery would allow, and six hours later this was the result. 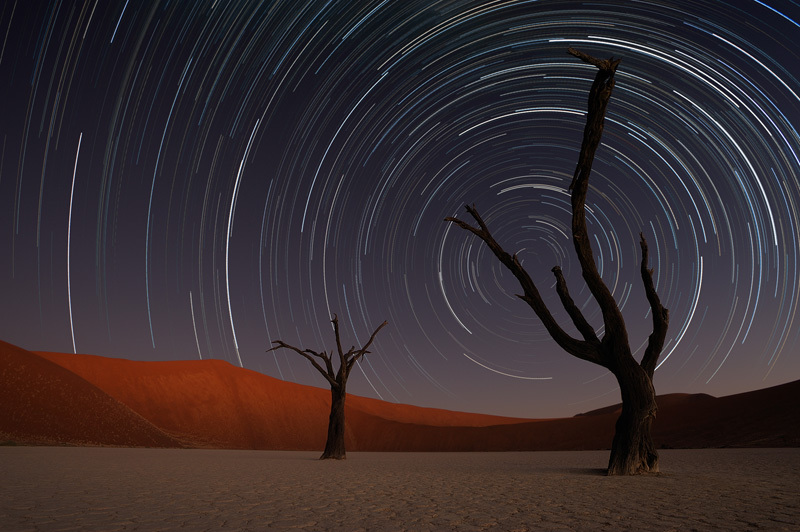 Deadvlei, Namibia.